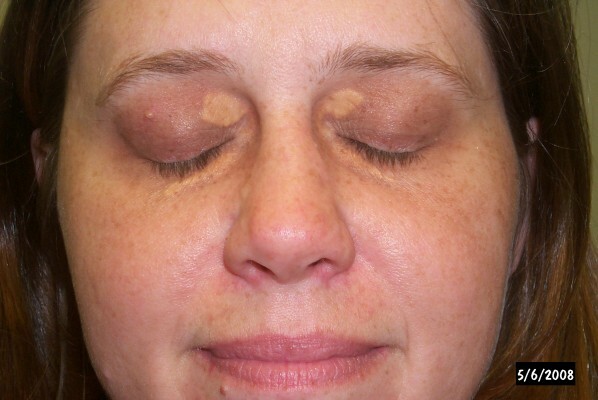 Xanthelasma (or xanthelasma palpebrarum) is a sharply demarcated yellowish collection of cholesterol underneath the skin, usually on or around the eyelids. Although not harmful or painful, these minor growths may possibly be disfiguring and can be removed. They are common in people of Asian origin and those from the Mediterranean region. Because of the hereditary component, they may possibly or may possibly not indicate high blood levels of cholesterol. Where there is no family history of xanthelasmata, they usually indicate high cholesterol and may possibly correlate with a risk of atheromatous disease. Xanthalasma (Greek – ‘xanthos’ = yellow, ‘elasma’ = metal plate) is characterised by the presence of small yellow plaques that are more often visible on the upper eyelid when compared to the lower eyelid. 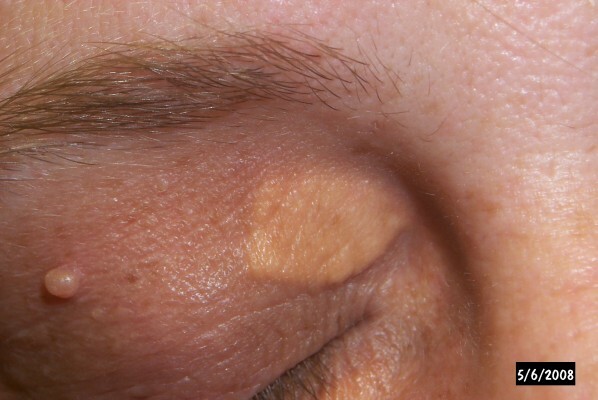 The most common site of these yellow plaques is the inner aspect of the eyelid, sometimes referred to as the inner or medial canthus. Although most patients have a normal lipid level, more than 30% do show an lipid abnormality. Serum cholesterol may possibly b elevated. Other than the characteristic yellow colour, the lesions can be hard i.e. calcareous or soft. 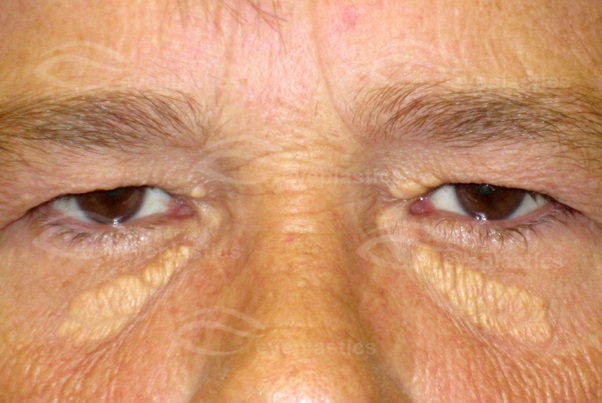 In the initial stages, they tend to be symmetrical with all four eyelids being involved. 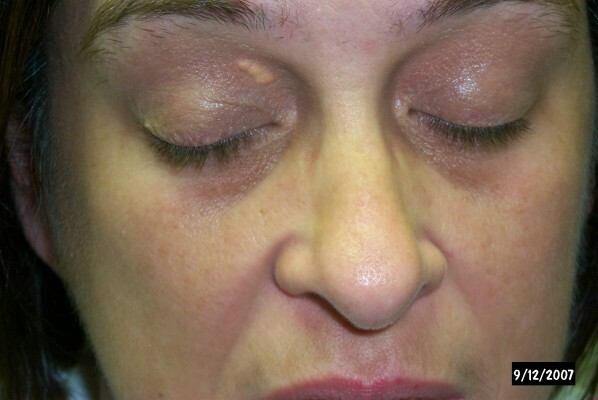 However, over time they may possibly join together and become larger lesions, making it look asymmetrical. 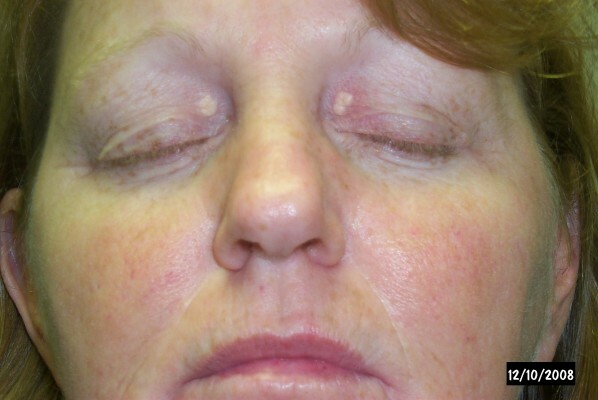 As has been described above, the lesions in xanthalasma are typically yellowish plaques that are seen on the inner aspect of the upper eyelids. They rarely cause any significant symptoms but in some cases they may possibly cause drooping of the eyelids, also called ptosis. 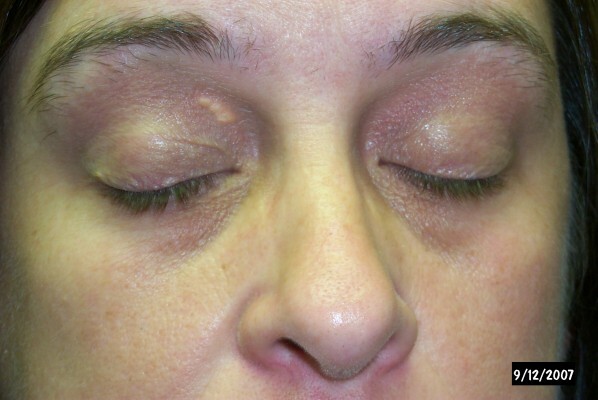 The characteristic appearance makes diagnosis is fairly simple to just clinical examination. Patients may possibly undergo additional tests to check their blood cholesterol and lipid levels. If required, a biopsy may possibly be performed for further analysis and all this will show is the presence of certain cells called histiocytes that have within them deposition of fat. By themselves, xanthalasma often do not cause any problems. If blood lipid levels are high, it may possibly require treatment. If the lesions are large and are causing problems with droopy eyelids, then in some cases, surgical treatment may possibly be offered. Additional specialist treatments such as laser ablative treatment are also available along with cryotherapy and cauterisation using chemicals.